350 pages | 22 B/W Illus. South Asians comprise over 15 per cent of all international migrating population, among the highest in the world. The countries of the Persian Gulf are perhaps still the largest recipients of migrant workers. A unique economy has developed between these two regions, with all South Asian nations being major beneficiaries and featuring among the top twenty countries receiving maximum remittances globally. 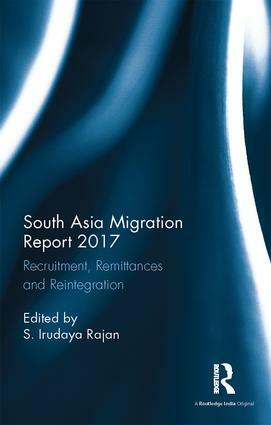 The South Asia Migration Report 2017 is the first of its kind, documenting migration profiles, diaspora, recruitment and remittances, both in individual countries as well as the South Asian region as a whole. It also discusses skilled, unskilled and internal migrations. examines the process of reintegration of returning migrants. This book will be indispensable for scholars and researchers of economics, development studies, migration and diaspora studies, labour studies and sociology. It will also be useful to policymakers and government institutions working in the area. S. Irudaya Rajan is Professor at the Centre for Development Studies, Thiruvananthapuram, Kerala, India. His recent works include Politics of Migration (with A. Didar Singh, 2016); Researching International Migration (with K. C. Zachariah, 2015); and Emigration in 21st-Century India (with Krishna Kumar, 2014). He is also the editor of the annual India Migration Report.